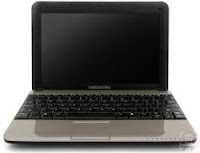 Medion is the latest company to announces a low-cost ultraportable that will take on the Eee PC. But looking at the Medion Akoya Mini‘s sleek casing, it’s hard not to compare this computer with the more professional looking HP Mini-Note. The computer will feature a 10 inch screen, an Intel Atom CPU running at 1.6 or 1.8GHz, at least 1GB of RAM, and a conventional 1.8 inch hard drive. The Akoya Mini will also ship with a Linux operating system, although it’s not clear which distro Medion will be using. You’ll also get a VGA output, a 1.3MP webcam, 2 USB ports, and a memory slot. The Medion Akoya Mini is due out this summer in Europe for €399 or about $640 US, although there’s no word on whether the notebook will be available stateside.